ittefaq is an upcoming 2017 Indian thriller film, directed by Abhay Chopra and produced by Red Chillies Entertainment and Dharma Productions. The film is inspired from the 1969 film by the same name, directed by Yash Chopra.The crime thriller that is being co-produced by Red chillies entertainment, Dharma and B R Studios and directed by B.R. Chopra's grandson Abhay Chopra, will however not be a direct rip-off, of the original that was considered as one of the path-breaking films for the lead actors then. Dev (Akshaye Khanna), a police officer, is investigating a double murder case that has only two witnesses, who are also the prime suspects. The suspects - Vikram (Siddharth Malhotra), an acclaimed writer, and Maya (Sonakshi Sinha), a young homemaker, have different narratives about the events of that fateful night. Both the stories seem true but there can only be one truth. Dev is torn between the two versions of the story, and will not settle till he finds out what happened that night. 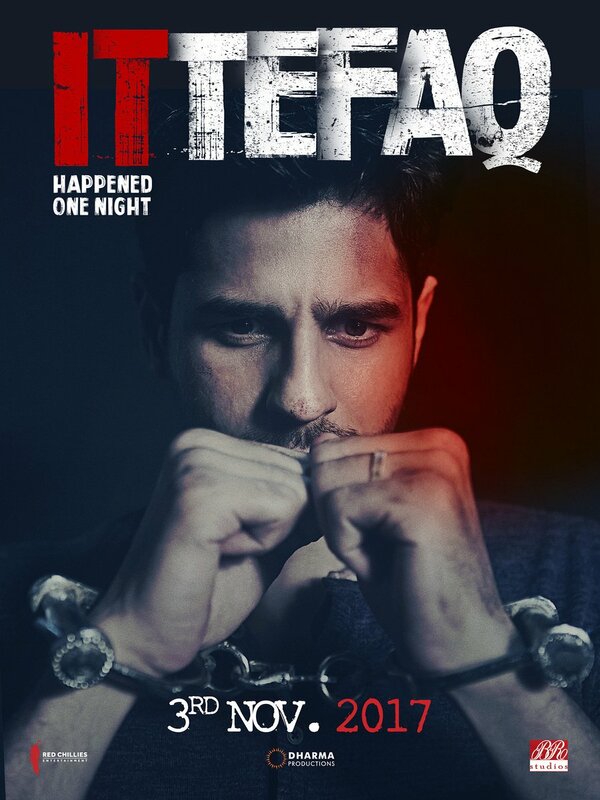 The story of Ittefaq, as we well know, is about two killings most foul. In the new take, a twist in the tale delivers an intriguing perfect-murder scenario in which the lawman comes tantalizingly close to bringing a fugitive to book. As a film, Ittefaq is definitely more than half-decent. It is competently mounted, compact and visually classy. As a thriller, however, its twists and turns aren't exactly of the kind that would blow you away. Ittefaq falls a tad short of being a genuine humdinger. But, to be sure, it falls only a tad short. What makes this film stand out is Abhay Chopra's smart direction. He has brilliantly handled this disturbing thrill ride. Not for a second, it feels like the man behind the lens is a first-time director. He tricks the viewers inside his characters without providing a complete picture of what’s happening. Sidharth looks believable as Vikram on screen. In fact, Ittefaq could become a career-changing film for the actor after he failed to impress the audience with his last two outings. Chopra has a fine sense of composition, pacing (watch out for those Match Cuts: in one instance, Sonakshi Sinha opens a bottle of liquor and Chopra cuts to a scene of Akshaye Khanna holding a glass of tea) and a love for genre-cinema that he makes no attempt to mask. This is a murder mystery for murder mystery-lovers and its deficiencies and heights are built into its rhythm. Watch Ittefaq because the film reveals a great deal about how Bollywood filmmaking has changed over the past five decades. As far as its final twist goes, Ittefaq is a whocareswhodunit but what it does have, as compensation, is the shock and suggestiveness of pulp served hot. If that isn't a big enough draw, watch it for nonpareil Akshaye Khanna. He overshadows everyone - and everything - in Ittefaq.